improved collaboration among specialists in law, medicine, health service administration and public health, on development and application of laws and policies to protect and promote reproductive and sexual health. Rebecca J. Cook, M.P.A., J.D., J.S.D., F.R.S.C. Bernard M. Dickens, O.C., Ph.D., LL.D., F.R.S.C. Melissa Upreti, B.A., LL.B., LL.M. Linda Hutjens, B.A., M.A., Ph.D. 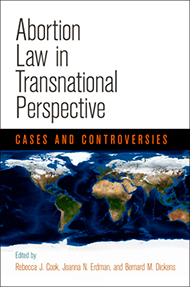 This book edited by Rebecca J. Cook, Joanna N. Erdman, and Bernard M. Dickens is available In English and Spanish, with a Table of Cases online.